Sour cream, whipped with sugar or powdered sugar is a great base for desserts. It can be used for greasing the cake layers, fill, berry cakes, making mousses and fruit creams. Prepare the sour cream at home is a snap. Just need to buy quality products and technology to comply. 1 teaspoon grains of gelatin. Buy cream high fat content. Ideally you need a high quality product with 30% fat, twenty percent, but sour cream would also work. It needs to be fresh, moderately acidic, with no signs of fermentation. If you got liquid product, strain it through two layers of cheesecloth placed in a colander. Before churning the cream should be cool. Place it in the refrigerator for 2-3 hours. Whip cream can with a fork, whisk or electric mixer. Place the sour cream in a deep bowl or a saucepan. Place the container in cold water or ice and beat quick evenly in a circular motion until you get fluffy, but dense enough cream. A sign of readiness – the appearance on the surface of a stable "peak". This mixture cover the surface of the muffins or berry pies, or serve it as a sauce for pancakes and crepes. Sift the icing sugar, mix it with vanilla or vanilla sugar portions and add it to the cream. Whisk it again until smooth. Instead of powder you can take sugar. If you need more air to the cream, whisk the sour cream with cream. Pour the cooled cream into a saucepan, add the sour cream, place it in a pot of cold water. Beat the mixture until a thick foam that should hold on the raised rim. Without stopping whisking, add the cream, powdered sugar, sand and add a bit of vanilla. This cream is suitable for greasing of the cake, filling tubes and prepare fruit desserts. Try to change the taste of sour cream. At the end of the process of churning add in the mass of sugar mixed with cocoa powder. Carefully stir the mixture. Will air cream with delicate chocolate flavor. It can be used for filling cakes and decorating the surface of the cakes. From whipped cream to prepare a cream with the gelatin. Place in a glass of grains or plates of gelatin, add a half a Cup of cream, stir and wait until the swelling. Put the glass in hot water and stir the cream until dissolved grains of gelatin. Cool the mixture. Prepare the cream in the basic recipe. 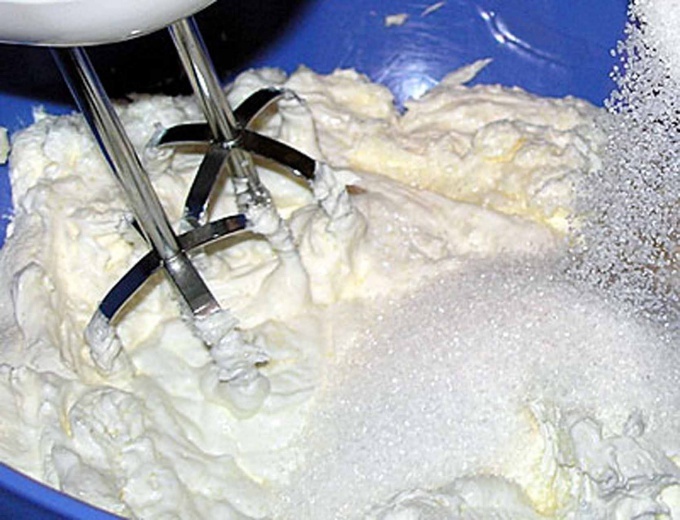 At the end of the whipping, a thin stream pour in sour cream lush mass of the mixture of gelatin and cream. Stir the cream. Use whipped cream immediately. If this is not possible, store the finished mixture in the fridge, but not more than 2-3 hours. The taste of sour cream is familiar to many from childhood. It is easily prepared and has an incredible flavor. For making sour cream is better to use a thick cream, which should be before preparing the cream to cool. It is worth remembering that such a cream should be stored in the refrigerator and preferably not more than a day. For cooking 400 gr. cream you'll need: 1 Cup sour cream, 4 tablespoons powdered sugar and 1 C. vanilla sugar. Sour cream put in a deep bowl, fit the pan. The pot is put in a basin with ice or ice water. Blend sour cream with a whisk or electric mixer until almost stiff. Mix the powdered sugar and vanilla sugar and add with continuous stirring in sour cream. The cream is ready. It needs to be thick and not run off the Corolla. The second recipe is using gelatin. To prepare 350 gr. the cream will need: 1 Cup sour cream, 4 tablespoons powdered sugar, 1 tbsp gelatin, 1 gr. vanilla sugar. Cream to cook the first recipe. Gelatin should be soaked in cold water (1 tablespoon of gelatin per 100 grams. water or milk) for two hours. Heat on the stove and strain. Pour a thin stream with continuous stirring in the sour cream. Since childhood every holiday for us involves waiting for a tea party. An integral part of this tea party is the cake. Sour cream is one of the most common creams to delicious cakes. Here's a few of them. Buy or make all the right components. The cream should be purchased no lumps, fresh, pre-it is better to cool in the refrigerator. Best of cream is suitable cream, where fat content is 30 %. And beat it better at low temperatures. A few hours before you will make the cream, you can strain the cream through a colander and cheesecloth, after which it will become a little drier, which means that the cream is not so strongly impregnated with cakes and save the form. If this is not done, the cakes will not need to separately impregnate, the cream will do it myself. Start preparing the cream. This chilled cream to whip with a glass of sugar until obtaining a lush mass. 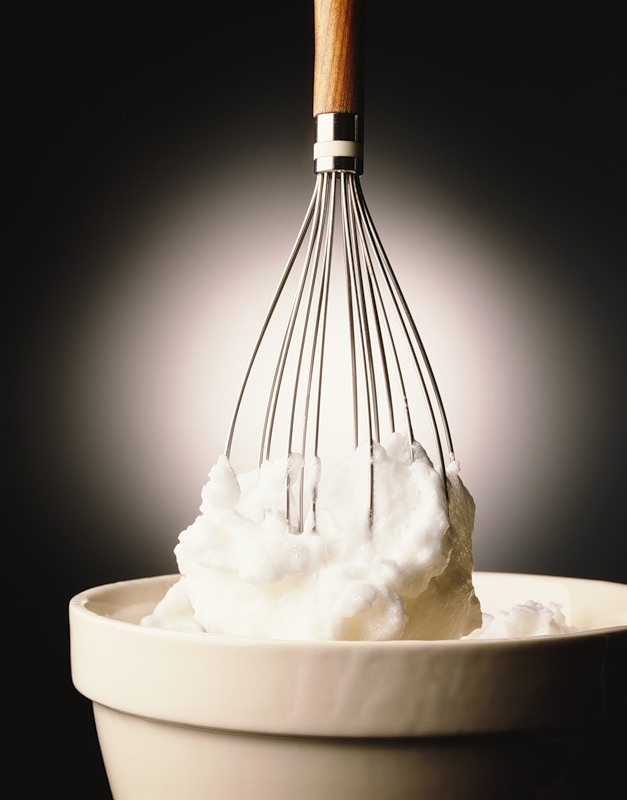 Capacity with sour cream while whipping with a whisk is better to put in a pot with cold water for even more cooling, otherwise your cream and not whipped. We can also add vanillin. Then your steps may be different, depending on which cream you would like to have. For dark cream chocolate, you need cocoa and coffee, which you should pour in the cream after sugar. If you want to fruit the sour cream, you can add a bit of gelatin, about 30 grams, previously dissolved in hot water. Then add mashed berries or jam and it all over again whisk. Also in the sour cream add lemon. For this you will need 1 lemon, which you need to hold in boiling water until tender and then cool. Then remove the seeds, and lemon skip through Mincer along with the zest. The resulting mass is necessary to mix in the cream and stir gently. Your sour cream is ready. Now still need to keep cold, and then spread it over cakes or to decorate the finished cake. You can also improvise, add to cream new ingredients to make sour cream with cottage cheese, cereal or anything else. You choose! Regular sour cream from the store, no matter how fat she was, suitable for almost any uses other than the manufacture of confectionery. In order to make sour cream thick, for example for use as a cream for baking, it started to thicken. Not all the hand is a special thickener, but it can be done easily using common household ingredients. Put sour cream in handy for stirring and heating capacity. Heat the cream in a water bath or in a microwave oven to a state close to a boil. Take one tablespoon of starch (without slides) and pour into the second tank. Dilute the starch with cold boiled water. The amount of water should be equal to the amount of the sour cream. Carefully stir the liquid with a spoon so that the starch is fully dissolved in the water. Constantly stirring the warmed sour cream, pour into it a thin stream of water with starch. Mix thoroughly the resulting mixture with a mixer. If you thought that the cream was not enough thick, repeat the steps from step 2. Cool the mixture before use. If you just pulled it out of the fridge, it should take a little time to warm up to room temperature. When heating sour cream should not boil. In any case, do not add a large amount of starch, even if You think that the sour cream too runny. Will have to throw out spoiled sour cream and start all over again. Add the starch little by little, carefully stir the ingredients to avoid lumps and evaluate the result. In the shop You can buy special thickener for cream and use it instead of the starch. Thickener for cream too. Also a good thickener for cream is flour of any kind and varieties, the dry or condensed milk, large amounts of sugar. For mixing the ingredients is preferred to use a narrow bowl with high sides. If you use thickened cream as a sauce for baking, it before using sour cream mixture to cool better. Cooking cakes at home is quite difficult, especially for beginners. Sometimes, even if a well-baked cake, the whole cake idea fails for lack of quality and tasty cream. The simplest, and at the same time delicious, creamy sour cream. Get your sour cream with fat content not less than 20%. Take a pan, on top put a fine sieve or put a thick towel. The right amount of sour cream, lay out on a sieve or a towel. Leave the pan with sour cream in refrigerator overnight. This process is necessary in the preparation of the cream. He removes the cream from the excess fluid. Plumb sour cream affects the quality and consistency of the finished cream. Remove the cream from the refrigerator, it should become dense, and the liquid remains in the pan. Liquid is nothing but the serum that later can be used for pancakes and other baking recipes. Chop the sugar powder. This can be done in several ways. For example, using a grinder or a blender. In their absence you poured sugar on confectionery paper, put on top another layer and roll with a rolling pin several times. You can also use a mortar and pestle, but in this case, the process will be more time consuming. Mix sour cream and sugar. Use the mixer for best result. Enter the powdered sugar in the cream gradually. Ideal finishing cream whipper - non-liquid consistency that will stand in the bowl (like a well-whipped whites). Be careful when you use homemade sour cream in cooking cream. With strong whipping, it will turn into butter. Promazhte cream layers cake, pre-soaked in his. This cream can be used for cake decorating, for example, using a pastry syringe. Diversify the cream. Add the vanilla to impart a delicate aroma. Or chop fruit or berries and add in the whipped cream. For example, strawberries, cherries are ideal for this recipe. Adjust amount of sugar depending on your preference. A Cup of sugar to a pound of sour cream - cream medium sweetness. If you don't have a whole night to plumb sour cream, nothing. Leave the cream at least 3-4 hours, and the result will improve. The main thing - do not take sour cream in its original form, otherwise the cream will turn liquid. Sour cream white, it has a delicate texture. 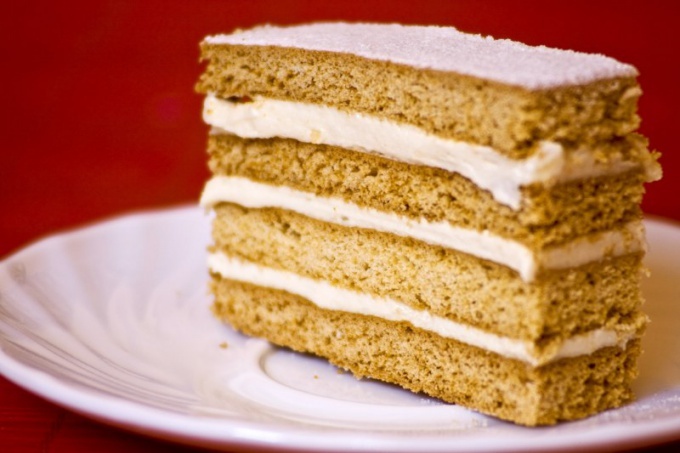 They can be sandwiching the cakes, put in cakes or eat as a standalone dessert. It is used as a sweet sauce in fruit salads. There are several variations of this sweet dish. 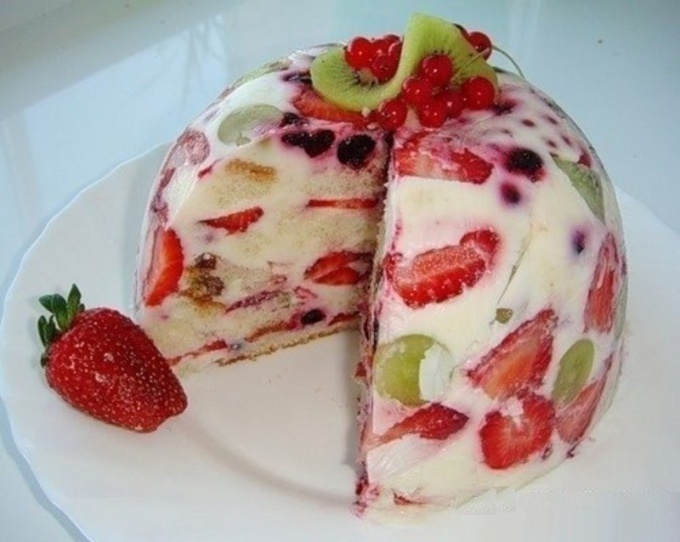 For the cake, it is desirable to use a "otvisetsya" sour cream, in other words, it needs to drain unwanted fluid. - 0.5 cups of sugar. Put a colander or large sieve with handle on the pot. Lay him in a towel and place this milk product. The whole structure is removed overnight in the refrigerator. During this time, the pot will gradually drain the excess liquid, the sour cream will be denser and better get whipped. It will be cooled, which also helps to improve the quality of the cream. Stir in sour cream, sugar and whisk it. You can now sandwich cream cake. First, put it on the cake and spread onto the surface with a broad knife. This cream will be a wonderful decoration and will keep its shape. If you want to make a large layer, similar to the basis of the cake "bird's milk", then you can use the following recipe. - 30 ml of water. 2. Pour in a ladle or small pan and, stirring, heat the mass to a temperature of 70-80oC. As soon as the gelatin dissolves, remove from heat capacity. This time make sour cream base. Stir in sour cream and sugar. If time is limited, you can replace it with powdered sugar. It will melt faster in the cream. Shake weight for 3-4 minutes. Pour it slightly warm the gelatin and continue to rotate the blades of the mixer. Optionally, you can put in cream fresh berries: raspberries, strawberries, currants. Winter will come and frozen. If you use low-fat sour cream, the cream obtained is low in calories, but liquid. So before you pour it on the base, put the cake in cake form. Now let this sit in the fridge for 30-40 minutes. On a slightly frozen cream, you can put the second cake and again to send the cake in the fridge. This cream with sour cream and gelatin will become independent and lovely dessert. When they put the berries, pour sugar mass in a bowl or wide glass glasses. Before serving, sprinkle with grated chocolate.